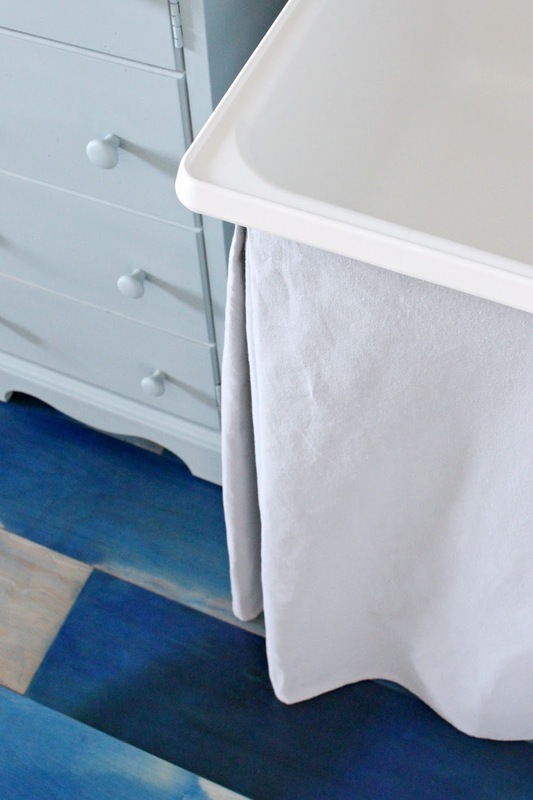 DIY Utility Sink Skirt | New Sink + Faucet for the Fish Room! The Fish Room is done! I’m working on the full “before” and “after” post, but it’s really difficult to photograph this space, especially now that the skies have turned dreary, snowy, and grey. 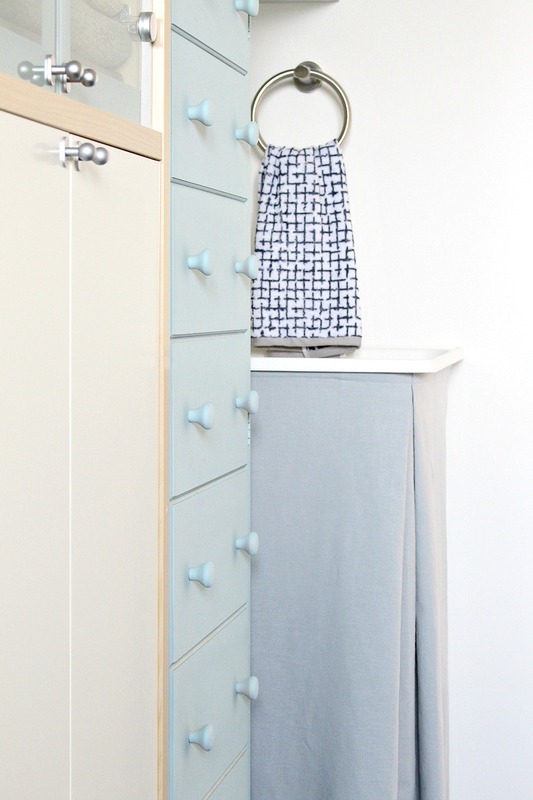 While I wait for the perfect sunny day, I wanted to start sharing some of the changes we made in this odd little room – especially the DIY laundry sink skirt my Mom and I recently made. 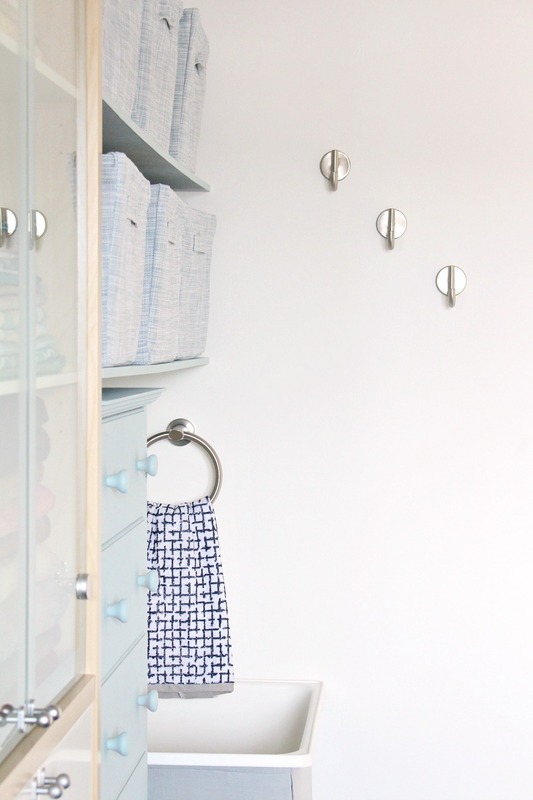 The last time you saw the Fish Room, it was just a sea of brand new DIY plywood floors (although I did give you a pretty big sneak peek in this post). 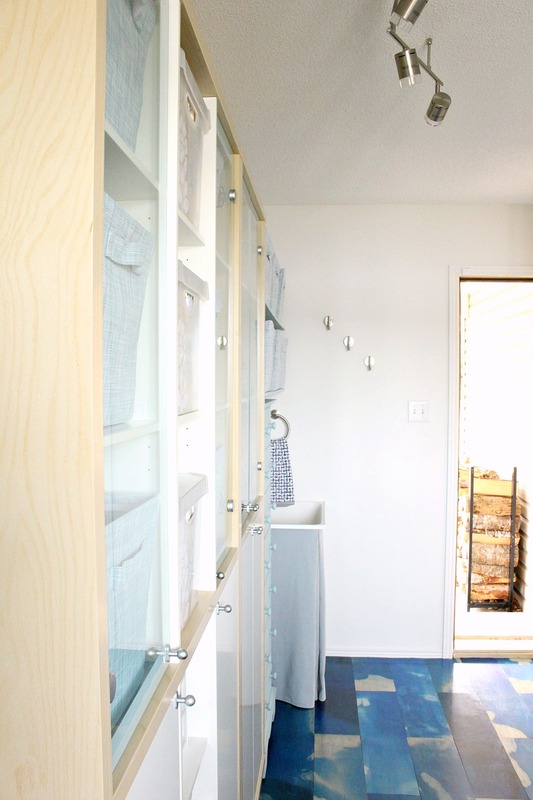 Now the room has furniture, shelving, storage – even a new sink and faucet! The sink and faucet is what I want to talk about today, because I am so smitten with the faucet we found. It was such a challenge to find the right size faucet to fit the sink we bought, which is really only designed to fit the ubiquitous chrome utility sink faucet. I had my eye on a few different designs (like this beautiful kitchen faucet), but they wouldn’t fit! Lucky for me, Delta came to the rescue with this classic single handle bar/prep faucet that’s sleek and gorgeous – and just happens to be the perfect size for this utility sink! cabinetry, I actually contemplated keeping the sink and just painting the cabinet because a new sink (even a cheap new sink) was more than my tiny budget could handle. But at the last minute I decided to rip it out – and I’m so glad I did! 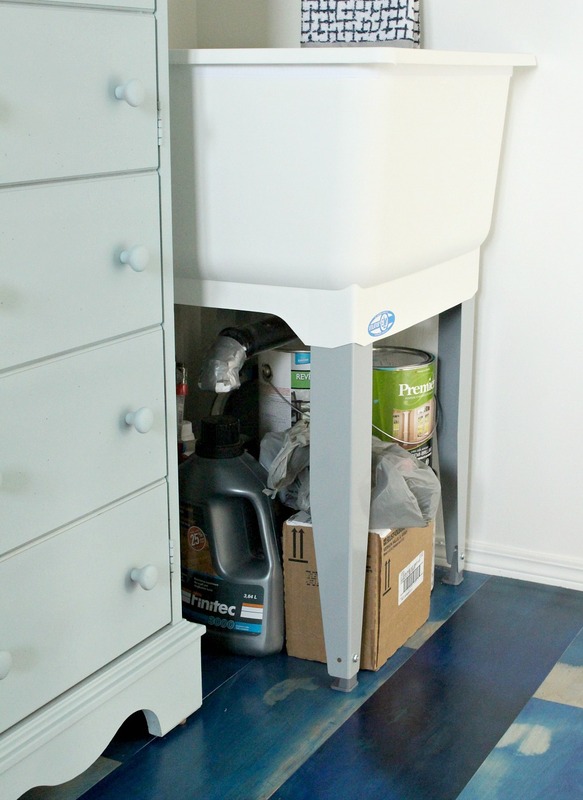 After impulsively ripping out the old sink and cabinet, I contemplated one of those fancy laundry tubs built into a sleek cabinet but those rang in at around $200-300. I couldn’t justify that price tag because when we eventually renovate this space we won’t need a laundry tub (we’re getting a dog washing station that doubles as a sink), so it seemed wasteful to buy that kind of cabinet now. Plus, who knows what kind of mess I’ll end up making in here – it is a craft room after all. 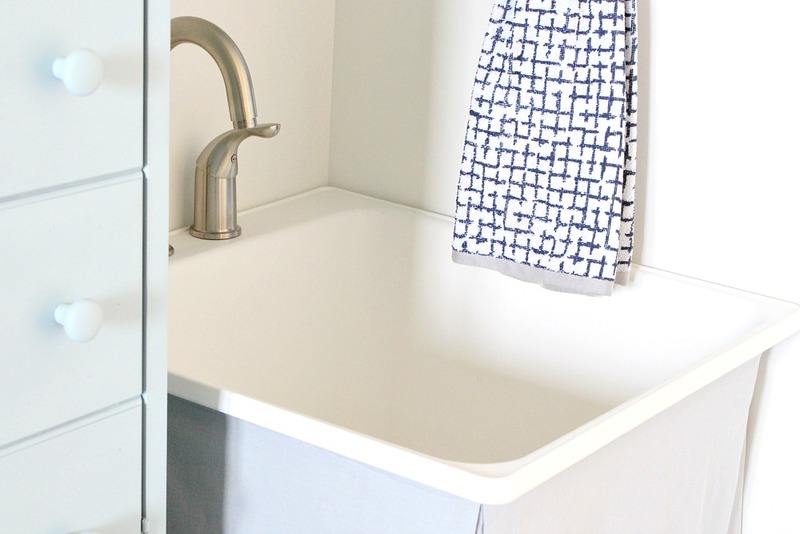 In the end, we found a really nice utility sink for super cheap in a local big box store, and something about it feels more modern than the typical laundry tub (see the old townhouse laundry room sink for a comparison so you can see what I mean). The only problem was those ugly legs! Yikes. I stash paint under there too, so I wanted to cover it somehow. We contemplated building some kind of encasement with the leftover watercolor stained plywood pieces but we both agreed that’s too much of a good thing. With the budget in mind, I re-purposed the fabric from my failed shower curtain hack (in the link, it’s the ruched monstrosity we tried before my Mom and I sewed the simple tweed-look curtain) and we sewed a simple skirt for the sink. I had seen some very traditional, fluffy looking utility sink skirts, but I wanted something more sleek and modern. 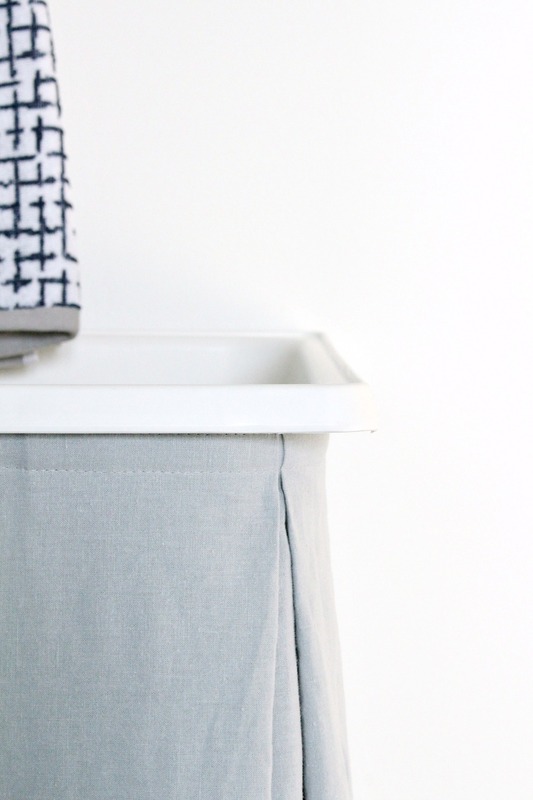 Making this DIY laundry tub skirt was so easy but it really helps the space feel more polished. Because of the location of the plumbing, the sink is right up against the wall so the sink skirt only needed to cover two sides, but we made it long enough to wrap around a little bit so it looks like it covers all four sides. 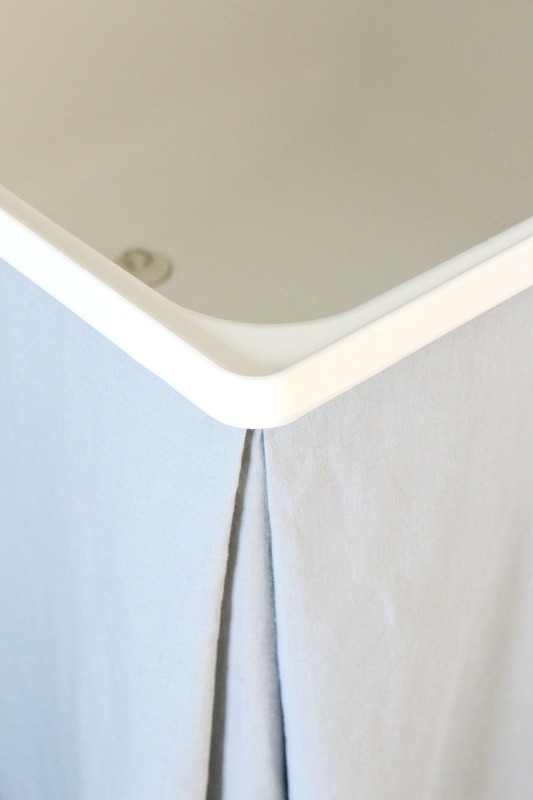 It’s basically just a rectangle with hemmed edges and to make it look a little fuller, but we also sewed a small pleat into the corners to give it some oomph. 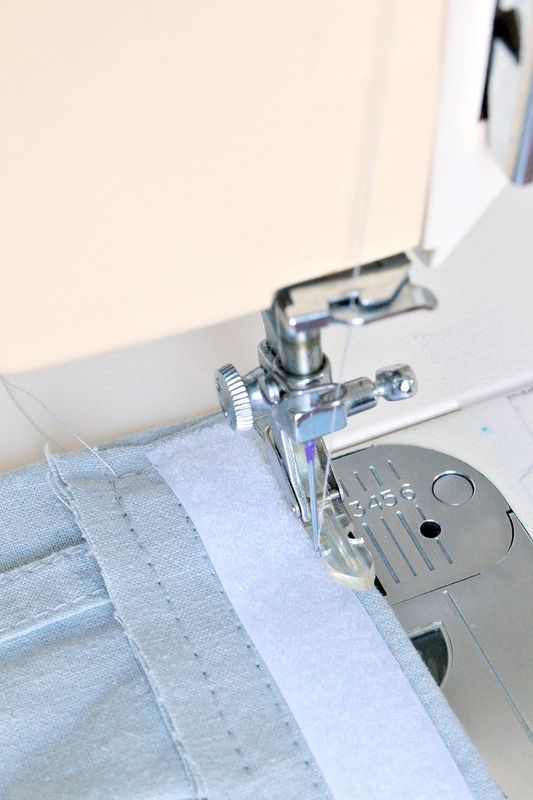 (Don’t mind out rough hemming job – no one will see it but blog readers, haha). 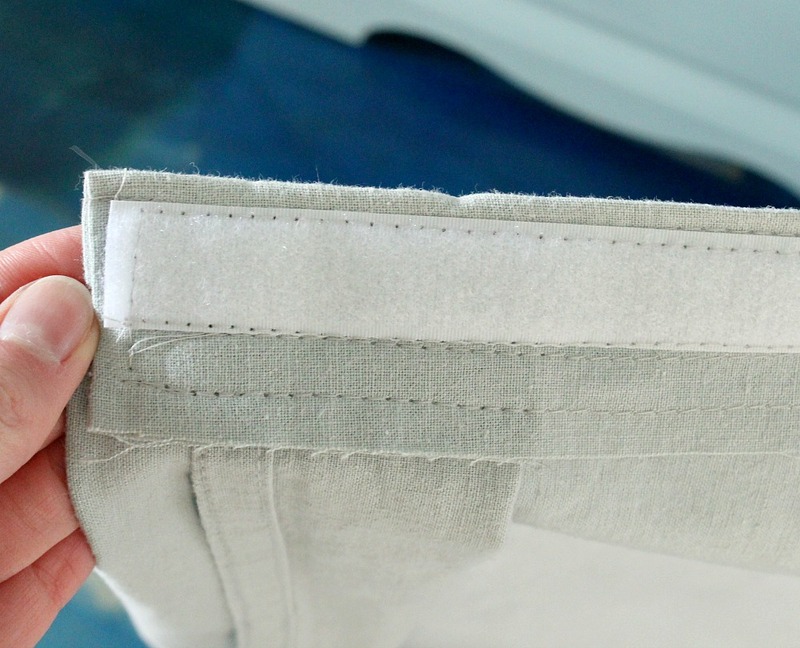 Then, using a zipper foot, we sewed on the velcro – the other side was backed with peel and stick tape and easily affixed under the lip of the sink. I love the pale blue/grey hue of this linen because it’s quiet and simple. Plus it always feels good to use up something instead of buying new – not that it isn’t nice to replace something broken and ugly with something shiny and new once in awhile! Along with the gorgeous faucet they sent me, Delta also provided the Compel towel ring (I hadn’t even thought of where I’d hang a hand towel) and three of the Trinsic robe hooks (which come in lots of finishes, including this gorgeous champagne bronze). Because this room isn’t accessible from inside the house, I usually don a coat or jacket to run over here, so it’s nice to have a place to hang my coat, keys, scarf, dog leashes – whatever. The Trinsic collection also has really beautiful faucets, like this modern wall mount bathroom faucet and this matte black tub faucet combo kit. You know my penchant for simple fixtures in matching brushed nickel. Even though this room isn’t accessible from inside, I still like that the faucet and accessories have the same modern feel and similar shape as the hardware and faucets inside. It makes the space feel less like an afterthought and more cohesive. 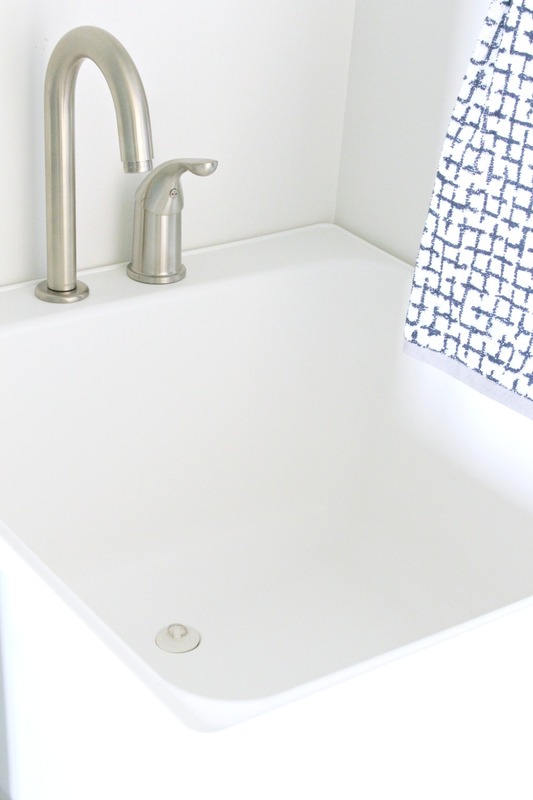 Plus, when we do renovate out here, it will be easy to transition these pieces to somewhere else in the house because although the utility sink likely won’t find a new home, the faucet and accessories definitely can! Knowing this makeover is temporary, I’ve been trying to make my design decisions strategically, with re-purposing in mind. 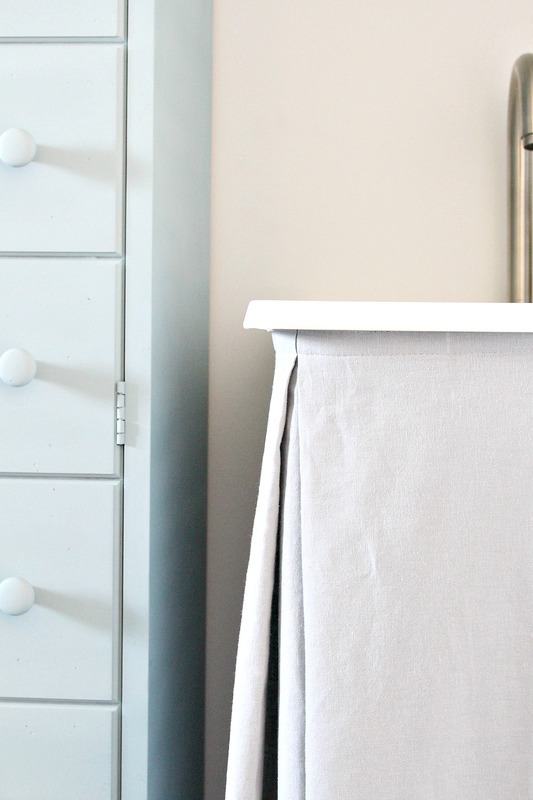 I can’t wait to show you the rest of the room, along with some more before and afters! P.S. Be careful online shopping because when a deal seems too good to be true, it might be a miniature that you almost mistakenly order, lol. Oh no!! Crazy glue and skin is terrible. I have a vivid memory of my mom gluing her fingers together when I was a kid. I never ever used crazy glue as a result of that memory! Hopefully you were freed pretty easily. Love the idea of a dog washing area!! Our German Shepherd loves our shower but after he's done mom has to clean all the mud and fur out of it! This is awesome! To see what you've done with what was there to now………..WOW! Love it and can't wait for the post with more details:)Amy in MN……and brrrrr, Winter is here ugh:( ******* cold + snow=not my fav! Thanks Amy! I think we got hit with same blizzard, did you have a ton o power outages too? I'm ready for spring, lol.